The New York Times, commenting on the frugality and competence of municipal government in Detroit vis-a-vis their city, titled their essay: An Honest City Hall. French architectural styles were increasing popular in the United States at this time so Anderson apparently toned down the Italianate styling in the ten- or eleven-year interval between designing the edifice and its completion. The City Hall was 200 feet in length and 90 in width with entrances on every side. It was a three-story structure with a Mansard roof, but crowned with a Georgian cupola. The interior floors were alternative black and white marble tiles. The building was erected with cream colored sandstone locally mined near Lake Erie. The New York Times’ journalist marveled at the low cost—$592,000. A picture of this new City Hall is also included in the book by W. Hawkins Ferry mentioned in the previous paragraph. After the functional City-County Building at the corner of Woodward and East Jefferson and designed by Harley, Ellington and Day was completed in 1955, the remarkable 1871 City Hall was razed. There appears to be almost universal agreement among Detroit preservationists that tearing down that architecturally and historically significant building robbed the city of an important component of its history. It is traditional to adorn court houses and civic buildings with statues of women representing justice and other civic virtues. Architect James Anderson commissioned the city’s most accomplished sculptor, Julius Theodore Melchers, to carve sandstone female representations of Justice, Art, Industry and Commerce. They were added to City Hall but I do not know of any good pictures of those depictions. Presumably they were smashed when the building was razed. At each corner of City Hall, Anderson designed a niche that might be filled with a statue of some impressive individual. Rate payers, however, did not fund those sculptures. Bela Hubbard, whose name lives on in the Hubbard Richard Historic District, made his fortune in land speculation and in the lumber industry. He had a strong interest in the arts and was one of the founders of the organization that evolved the Detroit Institute of Arts. Given his interest in the arts, he donated funding so that impressive statues might be commissioned to fill the vacant niches. Apparently, he first asked architect John Donaldson to sculpt the statues, but Donaldson knew that Melchers’ work was more impressive so Melchers was commissioned by Bela Hubbard. The statues represent four Frenchmen who explored and developed the area where we live. Jacques Marquette was born in Laon, France on June 1, 1637. That city is now the capitol of Aisne Département in the Picardy area. Marquette became a Jesuit priest and asked to serve as a missionary in New France. He arrived in Québec in 1666, and spent two years in Trois Rivières studying Montagnais—an Algonquin tongue still spoken by some Canadian Indians. He wished to minister to Indians, but also found exploring alluring. Marquette spent the winter of 1668 in what is now Sault Ste. Marie, and then,in 1669, established a mission toward the western end of Lake Superior near present-day Ashland, Wisconsin. The next year the Sioux attacked the Hurons and Ottawas who lived near Pere Marquette’s Lake Superior mission. He, and some of his Indian congregants, moved back toward the Straits of Michilimackinac where he established the village of St. Ignace. Thus the residents of St. Ignace may now claim to be residing in the oldest European city in Michigan. 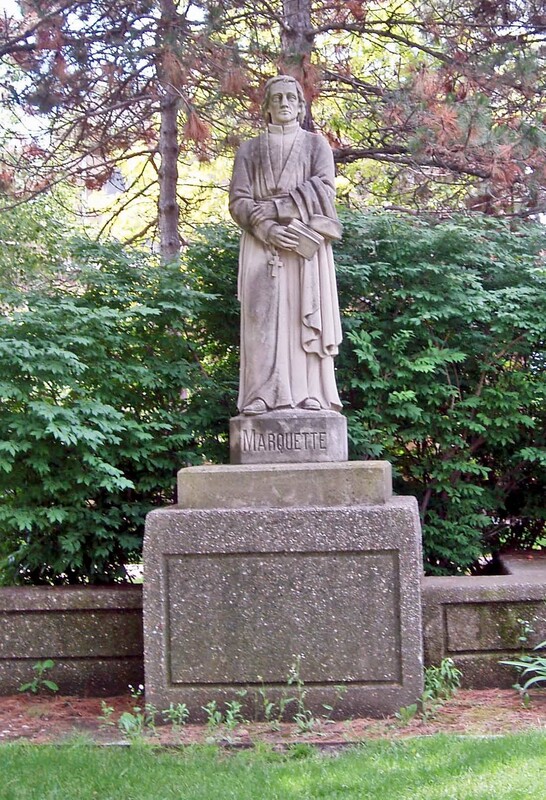 Pere Marquette chose the name Ignace since it is the French term for Ignatius, thus honoring the Spanish priest who established the Jesuit order. However, the French abandoned St. Ignace early in the Eighteenth Century so it is not a place of continuous European settlement. Louis Joliet, a French explorer, traveled to the Straits of Michilimackinac in 1671. He had heard from Indians about a major river located to the west. He hoped that it might be a river that cut across the American continent and would provide easy access to Asia. He decided to explore that river. Pere Marquette decided to accompany him and his party who traveled in five canoes. They left the Straits in May, 1673, paddled along the western shore of Lake Michigan into Green Bay, and then up the Fox River. They then portaged to the Wisconsin River and followed it to its entry to the Mississippi at Prairie du Chien. From there they sailed down the Mississippi. Thus Joliet, Marquette and their small party were the first Europeans to explore the upper Mississippi. They quickly concluded that this river led to the Gulf of Mexico, not to the Pacific Ocean. By the time they were quite far south of present day Memphis, they met Indians who had Spanish-made artifacts and good. At this time, the British, French and Spanish were contesting control of North America. Joliet spoke at least six American Indian language, but when he traveled toward present day Louisiana, he found he could not communicate with the native population. At this point, Joliet and Marquette erroneously believed they were not more than 250 kilometers from the mouth of the Mississippi. Fearing for their own safety and that they would be captured by Spanish forces, the Joliet-Marquette party reversed course and traveled north. When they got to Illinois, Indians told them about a shortcut that would make their trip back to the Straits much shorter and easier. They could canoe up the Illinois River to present-day Chicago and then sail north on Lake Michigan. Thus, these explorers were the first Europeans to traverse the Illinois River. They completed their long trip in September, 1673, less than six months after they started. Joliet returned to Montréal, while Pere Marquette spent 1674 at Baie des Puants (Green Bay). He wished to return to Illinois to minister to the large population of Indians living there, not far from present-day St. Louis. He got to Illinois but suffered from dysentery and decided to return to the Straits of Michilimackinac. Unfortunately, he died near present day Ludington on May 18, 1675 just before his 38th birthday. Marquette took detailed notes of his exploration with excellent descriptions of where he traveled. They are available in the publications of the Jesuit Relations. His bones were subsequently moved from Ludington to the missionary outpost he founded, St. Ignace. René-Robert Cavelier, Sieur de la Salle was born in Normandy in 1643 to noble parents. He rejected his inheritance and decided to become a Jesuit priest. However, he gave up his interest in the care of souls and took up exploration. His brother, Jean, was a Sulpician priest who had migrated to Québec in 1666. René-Robert La Salle joined him in Canada the following year with encouragement from King Louis XIV to explore North America in hopes of finding an expeditious route across the continent.. He secured a land grant from the crown to establish a residence at the western end of Montréal Island. He had a strong interest in exploring the New World so he named his homestead, LaChine, i.e., China. The major canal in that city still bears the name de la Salle gave his property. 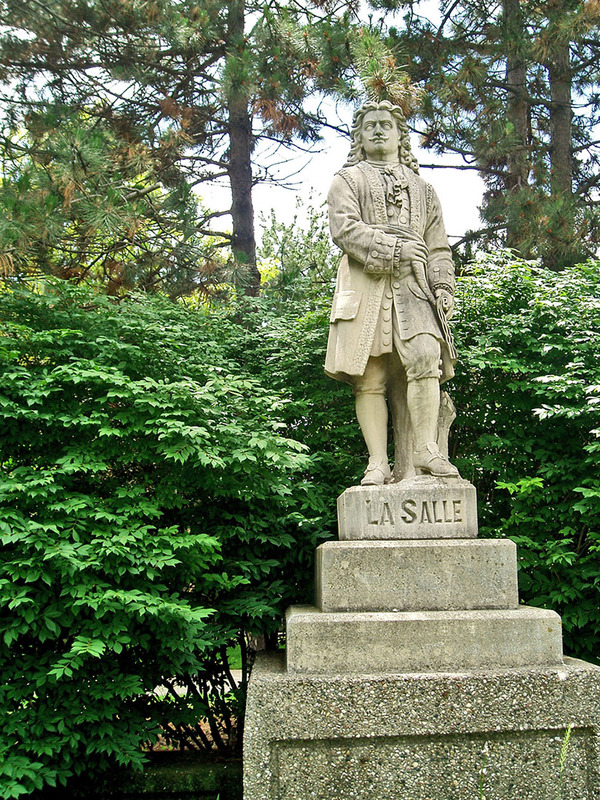 After arriving, LaSalle studied Iroquois and other Indian languages. From the Indians, he learned about a great river that was not far away—the Ohio. LaSalle hoped that river emptied into the Gulf of California which might make it easy for the French to travel to the Orient. Apparently La Salle led an exposition to explore the Ohio River as early as 1669. Presumably, he traveled from Montréal to the Ohio River and down as far as the rapids at Louisville. He turned around at that point and thus did not get to the Mississippi River. Marquette and Joliet were the first to Europeans to travel on the upper Mississippi. La Salle continued his explorations of the Great Lakes. He led a group that followed the north shore of Lake Erie, then through Lake St. Clair and Lake Huron to the Straits of Michilimackinac. Prior to that, the French reached the Straits by canoeing up the Ottawa River. In 1673, La Sale established Fort Frontenac (Kingston) on the shores of Lake Ontario as a fur trading port. In 1679, he began his major exploration. He spent the early part of that summer building a large vessel on Lake Erie—Le Griffon. It had a length of sixty meters and weighed 40 or 45 tons. In August of that year, he and his group sailed LeGriffon from its origin point on Lake Erie to the Straits of Michilimackinac and then on to Green Bay. At that point, he sent Le Griffon with a crew of six and furs on a return trip to Lake Erie while he and other members of his groups got into canoes and sailed down the western shore of Lake Michigan. Later that year, they sailed to the mouth of the St. Joseph River where they established a fort near present-day Benton Harbor and then up the St. Joseph to South Bend where they also built a fort. They portaged to the Kankakee River which led them to the Illinois River where another fort was established at present day Peoria. LaSalle traveled throughout the Great Lakes region but, apparently, had a strong desire to sail south on the Mississippi. In 1682, he led a group down the Mississippi from the Midwest to its mouth making him and his companions the first Europeans to accomplish that trip. He claimed this area for France and named it La Louisiane, for his patron, Louis XIV. In July, 1684, La Salle sailed for France and won approval to establish a colony at the mouth of the Mississippi. Presumably, this would thwart the Spanish by clearly demonstrating French control of this area and might grow into a prosperous commercial center. La Salle led four ships and 300 colonists from France to the mouth of the Mississippi later in 1684. The settlement was not a success. Pirates, disease and hostile Indians challenged the French immigrants. By 1688, only 20 adults remained. They were massacred by Indians and their five children taken captive.. The previous year La Salle led a group of French explorers along the coast of Texas. The group mutinied and LaSalle was slain by Pierre Duhaut. On September 18, 1679, LaSalle ordered that his vessel, Le Griffon, be sailed black from Green Bay with furs that might be sent to France and sold. The ship was never heard from again. Many assume that this was the first European ship lost on the Great Lakes. However, LaSalle had a much smaller—ten ton—vessel built the previous year and it sank in Lake Erie in January, 1679. For decades, divers have searched for Le Griffon. With the development of much better instruments and equipment, searching lake beds became easier in recent years. In 2001, the Great Lakes Exploration Group claimed they located Le Griffon, but before announcing its position, wished to establish ownership. The State of Michigan claims to own ships resting at the bottom of its lakes. Thus far, the State has not granted any rights to La Griffon. In January, 2009; the French government filed a suit in Michigan’s western district federal court claiming that they, not the state of Michigan, owned whatever remains of Le Griffon. This matter is still pending and may be a matter for the portfolio of Secretary Clinton. There are quite a few Catholic high schools and at least one major university in the United States that bear the name LaSalle. Alas, they are not names after Renè-Robert de La Salle. They are named for another Frenchmen, John Baptist de la Salle, who founded the Christian Brothers order of teachers about a century before the other La Salle first sailed for Québec. Antoine de la Mothe, Sieur de Cadillac was born on March 5, 1658 in St. Nicholas de la Grave in Départem ent Tarn-et-Garonne, the son of a lawyer. He received a military education and, in 1683, was assigned to serve as a captain in the Army at Port Royal, the large French fort in Nova Scotia. He married sixteen-year-old Marie Therese Guyon of Québec on June 25, 1687 and, thereafter, apparently used the name Antoine Cadillac. In 1688, Cadillac obtained a grant for land on what is now in Maine, including some on the mainland and all of Mount Desert Island, a location that is now home to Bar Harbor and Acadia National Park. Cadillac apparently hoped to establish a prosperous community here. I imagine he looked forward to a fur trading center. Just as he did in Detroit, he brought his wife to this location shortly after his arrival, but his efforts were not fruitful. The following year, Cadillac was recalled to France to report about ports and harbors in New England in preparation for a French invasion of that area. Cadillac never returned to his property in what is now Maine. The French navy did not attack the British in New England, but Cadillac impressed his superiors, especially Louis de Ponchartrain, who administered the Royal Navy. 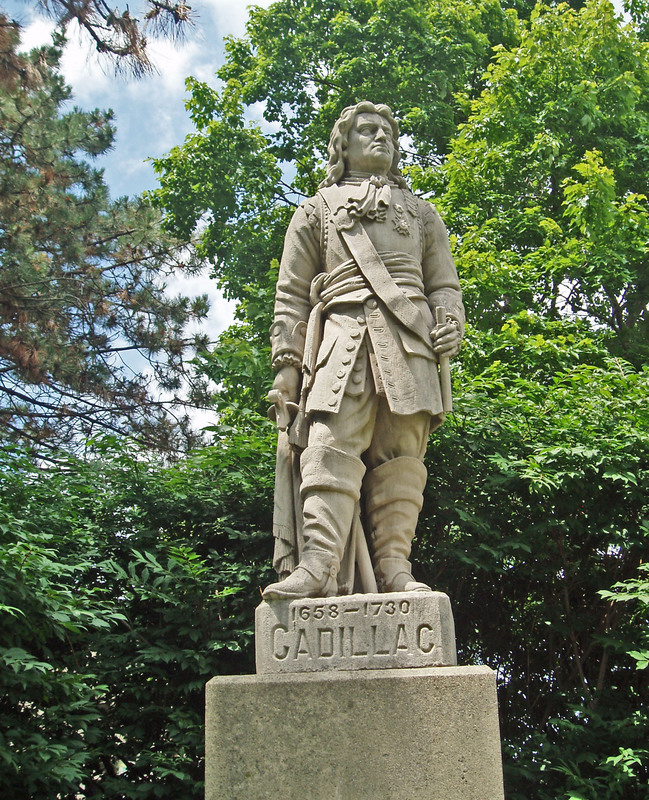 In 1694, Cadillac was appointed the military commander of the fort at Michilimackinac (St. Ignace) which was then the third most populated location in New France, following Québec City and Montréal. France, at this time, had quite a few small forts throughout the Great Lakes regions. The Jesuit priests complained that the French military who served in those forts were harming the Indians by trading brandy for furs. They call for the closing of the remote fort to protect the Indians. The French government ordered that all but four of them be closed, although their decision may have been influenced by the very high cost of maintaining such outposts in the wilderness. At this time, beaver prices fell to record lows so the French government was probably not gaining as much tax revenue as they wished but the forts required them to maintain a military presence. Cadillac thought that closing the forts was a terrible mistake and that the English would soon replace the French in them and thereby take over the Great Lakes region. In 1698, Cadillac traveled to Versailles to tell the crown about his ideas and to request permission to establish a new fort at Detroit, one that would also serve as a fur trading location. The king granted his request and Cadillac returned to Québec. On June 4, 1701; Cadillac led a group of about fifty military personnel and fifty settlers from Montréal. Because of possibly hostile Indians, Cadillac could not travel through Lake Ontario and Lake Erie. They canoed up the Ottawa River and then across Lake Huron. Cadillac arrived at the Detroit River on July 23, 1701 and went ashore at the present Hart Plaza on July 24. The city of Detroit was established by Cadillac who named the fort after his patron, Louis Ponchartrain. Many viewed Cadillac as a poor administrator, and in 1704, he was arrested in Québec on charges of dereliction in running Fort Ponchartrain. French administrators, French fur traders and the missionaries had major disagreements about how the place should be run and how the Indians should be treated. Cadillac defended himself and returned to Detroit but, I infer, there was continuing controversy about he administered Detroit and handled the testy relationships with Indians. In 1710, Cadillac was appointed governor of the Province of Louisiana. This was not a plum job. The Spanish sent De Soto to establish a colony at the mouth of the Mississippi and failed. Previously, the French had sent commissioned three individuals—Le Moyne d’Iberville, René-Robert de la Salle and Le Moyne Bienville—to set up a colony there and each failed. Indeed, three of the first four men to lead an effort to create a colony in present day Louisiana lost their lives in the attempt. Cadillac tried to get out of his new assigned and postponed leaving Detroit. He finally departed in 1711 and got to Louisiana in 1713. He established his headquarters near the present city of Mobile, Alabama. Apparently, the French government expected him to develop Louisiana, calm the Indians so that French settlers could prosperous and establish friendly trading terms with Mexico. I infer that he made little progress and so he was fired in 1716. He returned to France where he was arrested and briefly held in jail. At this time, a confidence man named John Law encouraged the French to invest in Mexico. Cadillac knew he was a fraud and warned against investing with him. Law, apparently, had the ear of the crown and Cadillac was briefly held in the Bastille but was never charged. He got out and spent much time litigating benefits that he believed the government owed him. At the time of his death, I believe Cadillac had suits pending in courts in both Paris and Québec. Eventually, he purchased for himself the governorship of the small town of Castle—sazzasin, now Castlesarrin—in Département Tarn-et-Garonne where he died on October 16, 1730 at age 72, Antoine Cadillac and Marie Therese Guyon had 13 children, perhaps six of them delivered while they resided in Detroit. The children appear have prospered and Cadillac’s wife outlived him for a decade in Castelsarrasin. Many aspects of Cadillac that are not known with certainty, and so far as I know, he left few if any written documents. You can find numerous conflicting accounts of his accomplishments and failures and significant dates in his life. You will even find comments that Antoine de la Mothe was a commoner who merely appropriated the title Sieur de la Cadillac. The largest mountain on the eastern seaboard of the United States, located on Mount Desert Island, bears the name of its first owner. Cadillac Mountain pierces the clouds at 1,532 feet, and every sunny day, is the first place in this county to see the light of the sun. Father Gabriel Richard was born in the city of Saintes, in the Charente-Maritime département on October 15, 1767 to François Richard and Marie Geneiève Boussuet. He attended local schools and his parents had the resources to send him a nearby institution called a college, but what we would identify as a high school today. He wished to study classics at the University of Paris, but his family lacked the resources for him to do so. In the fal l of 1784, he entered the Sulpician seminary in Angers. I do not know if he intended to become a priest or if he wished to available himself of the opportunity for an advanced education. However, he was ordained in October, 1790 and spent the rest of his life in many activities, including preaching. Fearing that the anti-clerical movement then spreading in France might lead to the deaths of some or many of their priests, Sulpician officials ordered Gabriel Richard and six other young priests to sail for Baltimore in 1792. Once there, Gabriel Richard began teaching mathematics at St. Mary’s seminary. The anti-clerical government of France held his mother responsible for his escape to the United States and fined her one-quarter of her assets in 1797. Shortly after arrival in Baltimore, the Bishop, apparently encouraged Richard and one of his fellow Sulpician priests, Michael Levadoux to travel west to minister to the Indians at Kaskasia in present-day Illinois. Richard arrived there in February, 1793. Richard learned that Detroit was the only Francophone village in the Midwest. Compared to the Indian territory where he ministered to souls, Detroit was a moderately large and sophisticated place. Richard, after all, had set his sites on a college education in Paris. As early as March, 1796, Father Richard wrote to his superior suggesting that he be transferred to Detroit. He first visited Detroit in August, 1796 shortly after Jean François Hamtramck had taken possession of the village for the United States. Richard returned to the Indians in Illinois but his interest in Detroit persisted, and in the summer of 1797, he came back. Richard and his friend, Michael Levadoux, were assigned to care for the spiritual needs of the Frenchand Indian residents of a broad area stretching north from the Detroit River. Early in his Detroit career, I believe that Gabriel Richard traveled north in the summers to minister to Indians and the numerous coureurs de bois who lived throughout what is now northern Michigan, Ontario and the Lake Superior Region. Father Richard took up his official duties at St. Anne’s parish in Detroit on May 3, 1802. Thereafter, Gabriel Richard devoted most of his efforts in Detroit. He, along with his friend Augustus Woodward, are the founders and developers of the modern US city of Detroit. On July 11, 1805, a fire started in a Detroit bakery run by John Harvey. The fire got out of control, and because it was a windy day, spread quickly. Between 9 AM and noon, the entire village was destroyed. Father Richard took the lead in providing assistance to the homeless population and in securing support from Governor Hall to rebuild the city. Contemporary reports suggests that there was nothing left standing in Detroit after Harvey’s fire. At this time, Richard uttered those words of hope that became the city’s motto: Speramus meliora; resurget cineribus. 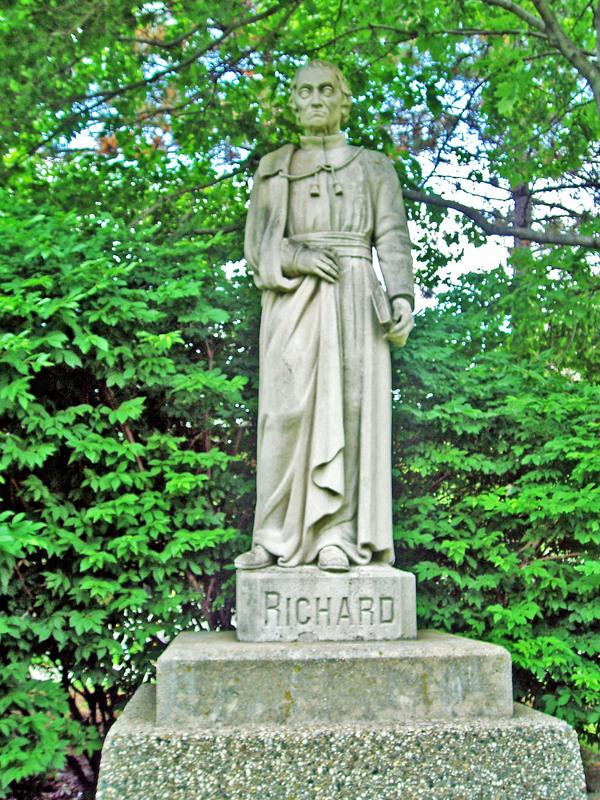 Richard founded at least six schools in the city of Detroit. The Catholepistemiad, that became the University of Michigan being the most well known. He served as the first vice-president of that institution and the first professor of mathematics. However, there is no convincing evidence that either Richard or the Reverend John Montieth, who briefly held the presidency, ever taught a class. In its early years in Detroit, it provided secondary school training. A picture of the University of Michigan’s first building is also available in the Hawkins Ferry book mentioned previously. Richard established the first press in the territory of Michigan. The first publication, dated 1809, was a book of spelling for school children. His press published the first newspaper in the territory, with the original edition dated August 31, 1809. That year, he also petitioned Congress to establish an educational system for Michigan territory. Richard remained in Detroit during the British occupation in the War of 1812, and then continued his involvement in the development of the city, although the population grew very slowly at this time because of its remoteness. Gabriel Richard was elected to represent the Michigan territory in Congress from 1823 to 1825. Once there, he advocated for federal spending to improve local roads such as the Sauk Trail that linked Detroit and Chicago. Controversy was not foreign to Gabriel Richard. While serving as pastor at St. Anne’s in 1816, François Labadie came from Montréal and married a local widow, Marie Anne Griffard. Father Richard learned that Labadie had abandoned his wife in Montréal. Richard denounced him publicly and threatened to excommunicate him. The store that employed Labadie fired him since it depended upon a Catholic clientele. Indeed, almost everyone in Detroit at that time must have been members of Father Richard’s parish. Labadie sued, charging libel, and won a judgment of $5,000 in 1815. This became a major issue for Richard for the rest of his life. Apparently he believed that he had a duty to condemn one of his congregants for deserting a wife and bigamy. Labadie obtained a civil divorce and Michigan and won the battle in the territory’s courts. Richard litigated the matter for the rest of his life. A retrial in 1821 ended with the same verdict, but the judgment against Richard was reduced to about $1,500. The court forced him to post bond and ordered him not to travel. Richard litigated this again and sought a new trial in 1823. Richard was elected to Congress in 1822 and claimed that the Constitution gave him the right to travel to meetings of that body, but his critics assumed that he was violating terms of his bond when he left Detroit for Washington. Richard and his attorneys continued this litigation and appealed to the federal Supreme Court. Father Richard died before the Supreme Court could reach a decision. Prior to 1798, Michigan Catholics were administered by the Bishop in Montréal. When the United States took possession of Michigan, Catholic were administered by a diocese whose seat was in the French village of Bardstown, Kentucky. By the late 1820s, there was recognition that there were enough Catholics in Michigan that Detroit should have its own bishop and the Gabriel Richard was the appropriate person. However, Vatican authorities apparently realized his legal troubles and feared that he might be imprisoned for non-payment of debt, so he was never appointed the first bishop of Detroit. On July 4, 1832; the steamer Henry Clay stopped in Detroit on its way to Chicago. One of the passengers—a soldier—became ill, was taken off the ship and quickly died of cholera. Shortly thereafter there was an outbreak of that disease in Detroit. The disease ran its course by mid-August,but by that time, there were 51 deaths from cholera in the city. Richard, in early September, realized that he had contracted cholera and died of that ailment on September 13, 1832. The four statues that you see were put in storage when Detroit’s classic city hall was razed in 1956. The Ludington family later paid for a plaza on the Wayne State campus where they were installed. The sculptor for these statues was an interesting artist who played a significant role in the city’s cultural history. Born in Prussia in 1829, Julius Melchers started his study of carving at an early age. He had to leave his homeland in the revolutionary year of 1848 so he traveled to Paris and graduated from the École des Beaux-Arts. He was active in politics there and found it strategic to leave for London in 1852. One year later, he decided to migrate to Detroit where his career flourished. His son, Gari Melchers, was also a well know Detroit sculptor. Julius Melchers lived long enough to know and provide some training to the city’s most accomplished architect, Albert Kahn. Melchers ranks with Corrado Parducci and Marshall Fredericks as the city’s most accomplished sculptors.